“This is a cool synth. “For sale is my beautiful Roland SH-3A. I bought this a few years back from a dealer in France and, despite being assured it had been serviced, it arrived with a number of faults. Fortunately, I’m able to do my own repairs (I have a degree in Electronics) and discovered around 8 dry solder joints and some fragile connector wiring, all of which I fixed. At the same time I checked all the other connectors, cleaned all the pots and re-calibrated the tuning. Since then it has remained rock-solid. It has what looks like the original European plug – I use a UK adapter which I will include. The keyboard stand in the photos is not included! ” Recently serviced and added kenton cv/gate/filter which can be turned on and off.Amazing! All keys work and no crackly pots. “This listing is for a Vintage Roland SH-3A. This unit is working. Beautiful and Good condition. But 8′ PLUSE does not sound. 8′ SQUARE and SAW are OK.
Maybe this is just switch contact failure problem. This unit comes with the original hardtop. ” This SH-3A is in perfect working condition and in very good condition!! This synth produces crazy sounds! This is my fantastic Roland SH3a, one of the most versatile small analog synths ever released, converted into module form with the removal of the keyboard and transfer of the power supply into a separate casing with captive connector cable. The SH3a is unique as a sound effects synthesizer in having a single oscillator with multiple footages all with different waveforms, “chorus” (pulse width modulation) on the 8 foot waveform, dual independent LFO’s, white noise, and a sample & hold section capable of creating complex glissando and arpeggio patterns. I used this SH3a for sound effects as a substitute for the larger and more expensive EMS Synthi VCS3, and with some reverb and delay added it sounds stunning. White noise is also included and there are various modes for bending the pitch, as well as voltage inputs for filter and oscillator on the rear. There isn’t a Gate input so with the keyboard removed you can’t play melodies on it as such. But the three keyboard connection cables are bundled inside and an experienced engineer could access these to restore keyboard functions, or to interface an analog sequencer. I have NOT kept the keyboard. “This SH-3A has been used in various recordings and is in good working order. The hard case is included (top and bottom). This unit is working. All keys, Knobs are fully functional. But the Power switch is not work well. It’s always ON. “THIS SH-3A 1973/74 VINTAGE SYNTH IS IN PRISTINE/MINT CONDITION, IT HAS BEEN VERY WELL LOOKED AFTER AS YOU CAN SEE FROM THE PICTURES AND HAS VERY RARELY BEEN USED, THERE IS A MAINS LEAD CONCEALED IN A SMALL BOX AT THE BACK AND TWO ORIGINAL MANUALS, THIS COMES COMPLETE WITH HARD FLIGHT CARRY CASE AND MUSIC SHEET STAND WHICH FITS INSIDE THE LID. THIS REALLY IS A RARE FIND IN SUCH GOOD CONDITION! 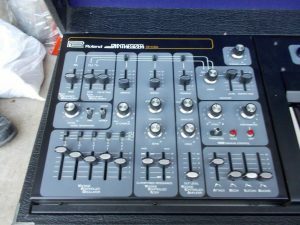 “This listing is for a Roland SH-3A synthesizer, fixed in a black flight case. Roland is a highly respected brand in the music industry and are legendary for their instruments, especially synths, where they unarguably led the way in sound progression. The item overall is in fair condition considering its age (1970s), as it has been kept in its closed case when not in use. There are some issues, it could do with a service! There are issues with the vcf and vco preset envelopes, and some of the sliders need attention. technically competent, or given a professional service! It has a power lead built in which is easily accesible/storable in the base of the case. The case has seen better days, but again is good for its age. (pre. 1978)” Auction ended. Click here to browse on eBay. 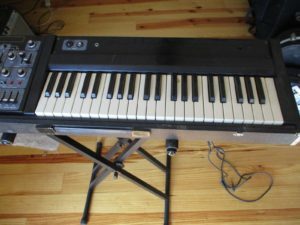 “Selling my Roland SH-3A… Condition is “Very Good +++”; Cosmetically it is near perfect. …Electronically it’s perfect. just a few minor hiccups. Keyboard tracks accurately; all keys work… The only minor flaws are a couple of the sliders are slightly noisy (as one would expect with age), and one of the buss switches (tremmelo switch is a bit funky). I think a quick spray of electronic cleaner on the sliders should help. Otherwise, the synth is rock solid and sounds fantastic…… ” Auction ended. Click here to browse on eBay. “Verkaufe meinen analogen Roland SH-3a Mono Synthesizer aus den 70ern wegen Neuanschaffung. Optisch und technisch noch gut in Schuss. Alle Schiegeregler funktionieren und sogar die Schutzfolie ist auf den Drehreglern noch drauf. Der original Deckel und der Notenhalter sind auch mit dabei. Sehr rarer Synthesizer, auch für Sammler sehr interessant. Nehme gerne auch Tausch- oder Preisvorschläge entgegen.” Auction ended. Click here to browse on eBay. “This listing is for a Roland SH-3A synthesizer, fixed in a black flight case, in full working order. The item overall is in great condition considering its age (1970s), as it has been kept in its closed case when not in use.